When you first asked me to think about writing Doctor Who reviews for Jodie Whittaker’s debut series as the Doctor, my face immediately ran apprehensive and strange. As I told you then, my concern was that I have, in the past, said less than kind things about Doctor Who’s new show-runner, Chris Chibnall. I feared that I would become one of Those Fans: the Who-vier Than Thou, “So much better back when” strident old snarlbuckets that tut about continuity and can’t wait to savage the latest episode. And it’s particularly true right now that we (I think you agree) don’t need another voice who uses his disappointment about plots and dialogue as a cudgel to tell people why something that makes them happy should make them unhappy. Jodie Whittaker, like all Doctors, is going to be someone’s favorite Doctor. 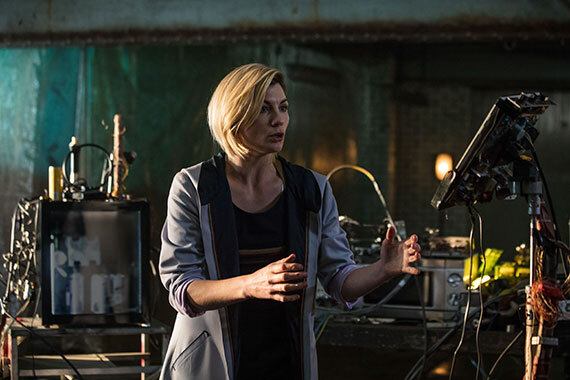 Jodie Whittaker, unlike any Doctor before her, is entering the public consciousness at a moment ringing with international political, social, and vocational issues that uniquely resonate with her Doctor. To make anyone doubt for a second their own feelings, or to make them feel ignorant or naïve about a TV show, a character, or an experience that is important to them, that they love, is unnecessary and cruel. If I can’t write about this era of Doctor Who without being overwhelmed by all the things that are Not To My Taste, then I just need to shut up about it. I’m happy to report, Derek, that I don’t need to shut up. Not today, anyway. Jodie Whittaker’s first episode is, as she foretold last year, “Brilliant!” Doctor Who has never looked so modern (of course, Doctor Who always looks more modern than it used to, but sometimes its modern doesn’t match up with the rest of television’s modern). Sheffield radiates gorgeousness under the direction of Jamie Childs and camera of Mark McQuaid. The new music by composer Segun Akinola creates a soundscape of menace and mystery. The supporting cast (Bradley Walsh, Tosin Cole, Mandip Gill, and Sharon D. Clarke) charm, with aplomb. The aliens look remarkably unclunky (Did you get an anime vibe off them, too? ), and, bonus! you can actually understand their electronically treated voices on first viewing. There were nods to old dialogue and echoes of classic themes, but nothing was made opaque to the new viewer as far as I could tell. It’s change, says the story, and change you can feel reassured by. Welcome, everyone, to this brand new show you’ve known all your lives. Every Doctor finds their way over time. That Jodie Whittaker’s interpretation of the character will evolve is made explicit in the dialogue. She’s neatly uncomfortable at times, rolling out words that weren’t quite meant for this tongue, but shaping her future ones. Her Doctor is always moving, both existentially and physically. In this first hour, we see how a) in 55 years, they’ve never cast the Doctor wrong, and b) Jodie Whittaker is an actress who will forge this role to her strengths. She’s already everything you want in a Doctor, and I suspect she’ll add to the character in fascinating ways. Expect more change. Am I gushing? I don’t mind if I gush. Everyone on the Doctor Who team knew the stakes here, with a new Doctor and an old series running for 13 (or 55) years. They all brought the very best they had in them. I admit I was worried. I admit I was doubtful. But this is still Doctor Who. Right there on the screen, even without a blue box or a wheezing, groaning sound. Is it perfect? Of course not, it’s Doctor Who. Doctor Who is riddled with holes and premised on faultiness. That’s part of its greatness. If we keep having these conversations, maybe I’ll add in a “Complaints Corner” the way other articles have a “Spoiler Curtain.” But this is not the day for that. This day, I am relieved, and excited, and so very happy with Doctor Who and the people who make it. And how about that theme song? Right? Right?! Mark Anthony Masterson gets stuck when thinking about his bio. He's co-owner of Illusive Comics & Games, but the road there wasn't so much long and winding as a Möbius Strip.